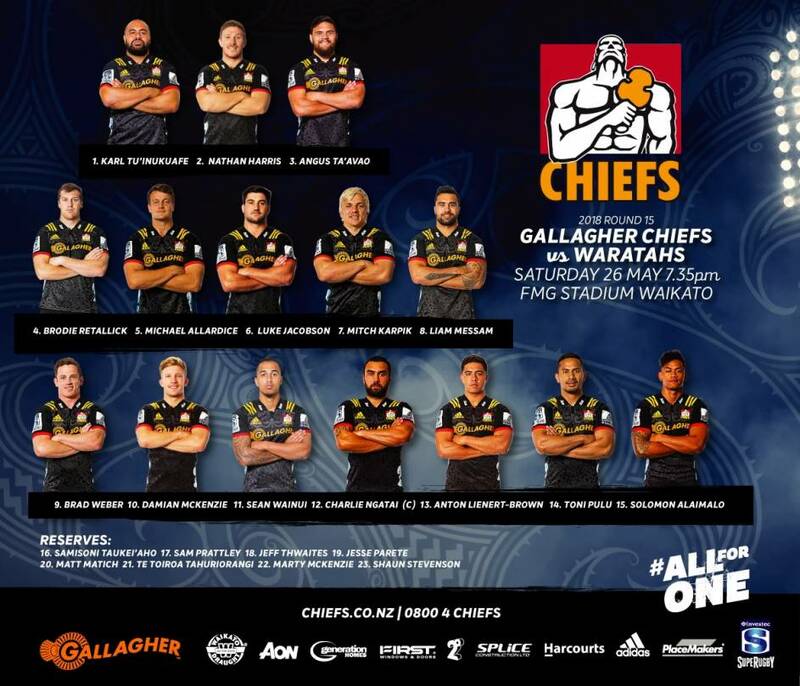 The Gallagher Chiefs are back at home this Saturday for a huge Investec Super Rugby clash against the Waratahs. The team is braced for the Sydney based side who have posed a significant attacking threat throughout the season and lead the Australian conference. The home side are back from their South African tour where they won a tough game in Cape Town against the Stormers, and narrowly lost against the Sharks in Durban. Head Coach Colin Cooper said that the team are doing a lot of work and planning on how to nullify the Waratahs attack. There are seven changes to the starting fifteen that took the field against the Sharks. In the forwards, All Blacks Nathan Harris and Brodie Retallick return to the number two and four jerseys respectively, while exciting flanker Mitchell Karpik gets a start at number seven. Veteran Liam Messam will wear the number eight jersey. Damian McKenzie and Anton Lienert-Brown return to the backline after time at the All Blacks camp, and Toni Pulu starts at right wing. It’s a first chance this season to see the midfield pairing of Charlie Ngatai and Lienert-Brown in action together, which fans can get excited about. Newest All Blacks recruits Karl Tu’inukuafe and Te Toiroa Tahuriorangi both feature in the 23, with Karl starting at loosehead and Te Toiroa on the bench. Cooper commented on their determination to take all opportunities offered this season. The Chiefs Rugby Club are carrying on the great efforts from Pink Shirt Day Aotearoa by spreading kindness in our community this week and promoting positive sideline behaviour. It’s an ongoing campaign through Chiefs in the Community to encourage supportive sideline behaviour at all levels and in all codes. The Chiefs Rugby Club will be raising funds for Mental Health Foundation NZ by auctioning off uniquely designed Chiefs pink tees signed by the team. The key messages for this campaign are #ChiefsCheerBulliesBoo and #SpreadKindness. The game kicks off at 7:35pm at FMG Stadium Waikato. Fans can enjoy a fantastic double header, with the University of Waikato Chiefs Cup final taking place as the Curtain Raiser which will kick off at 5:10pm between Rotorua Boys High School and Wesley College.